Perfect for schools, churches, synagogues, mosques, community organizations, businesses, support sites, extended families, non-profits, and scales to support large campuses and businesses! WebCrossing Neighbors is a complete private-labeled social network with personal home pages, discussions, blogs, activity feeds for groups and friends, groups and friend relationships (including friends-of-friends). Post by email is included, and each site has their own Private Virtual Server with dedicated IP address, web server, mail server, ftp server and it’s all fully scriptable so you can add and customize features! Visit the Neighbors Demo Site to try it out yourself! Why Neighbors? 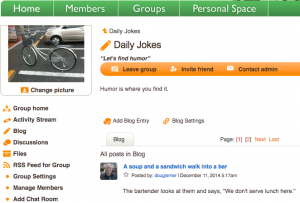 Why not just use a Facebook group – or a WordPress site you build yourself? Think of your organization. Say it’s a church, synagogue or mosque. Or a school. Or a social organization. Or a small business. If you put content on Facebook it’s out of your control. And it’s not organized into different group organizations. And it’s hard to find past content. And you have no place to store important files for sharing. And there is no real privacy. With Neighbors you can have completely private groups for different committees to discuss things in private. 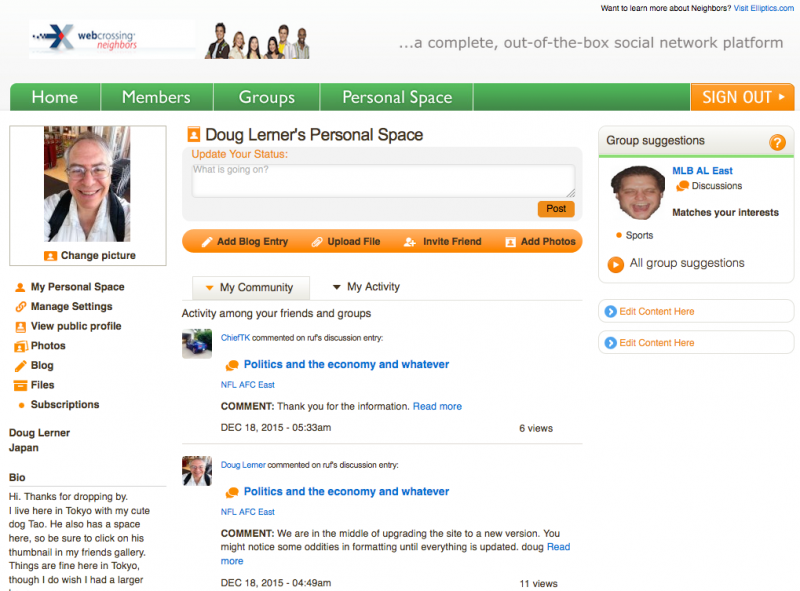 You can have public groups for activities and on-going social groups in your organization. Each group can have public or private file libraries to share resources. Each person also can have file sharing and a personal blog. Groups can have discussions. Groups can also have blogs for announcements. You can have groups for all members, or groups just for members interested in certain topics. Members can receive notifications of discussions and even reply by email to participate easily. You can turn on other tools, like Calendars and Wikis. You can completely customize the landing page of each group. You can decide what profile info you want to allow members to provide. People can become friends with each other people within your organization without mixing it up with outside organizations. You can have your own site branding. Your own banners. Your own group icons. Your own URL. There are no ads. The data is yours and you can export it whenever you want. And you don’t have to build a system from parts, or maintain anything. It all just works. And we are there to help you. And your content is safely backed up every day. It’s a world of difference. It’s your own social network to use as you like. Small or big. And you can grow as large as needed. WebCrossing Neighbors group tools include blogs, discussion forums, calendars, wikis, custom pages, file stores and more. Each group can have a custom landing page. Public, private and hidden groups are supported. User home pages let each member have their own blog, file library, photo album, chat and discussions. Invite, join, connect, search, auto-recommend groups of interest and much more. Each member’s home page includes their profile and gives them a space where they can create and share content, and even share files with their friends and other site members. User profiles are highly customizable, and groups-of-interest are automatically suggested based on your profile. A highly optimized tags engine makes advanced user, friend and group member search extremely fast. Post by email let’s members reply to posts, create discussions and update blogs conveniently from anywhere. You decide which features are available for your members, and you control the server operation and customization through easy-to-access control panels and switches. Your Neighbors site can be used out-of-the-box in minutes, or can be customized by modifying style sheets, changing settings, or custom development. Full access permissions provide a secure gateway to group and space content for group members, space friends or whatever level of access you require. Members have full control over who sees their content, including their profile information. Demographic and usage charts help you track your membership composition and relationship development by monitoring the growth of friends links, group membership, hits and posts throughout your site over time. WebCrossing Neighbors runs on WebCrossing Core, a high-performance collaboration system, permitting an unlimited number of simultaneous users restricted only by platform capabilities and bandwidth. The high-performance server application is implemented in the C programming language, eliminating the overhead of interpreted languages such as PHP. Additional performance is achieved by extensive use of sophisticated data caching techniques to eliminate slow disk accesses whenever possible. A single WebCrossing Core instance is capable of serving hundreds of thousands of page views per day on high-performance hardware.